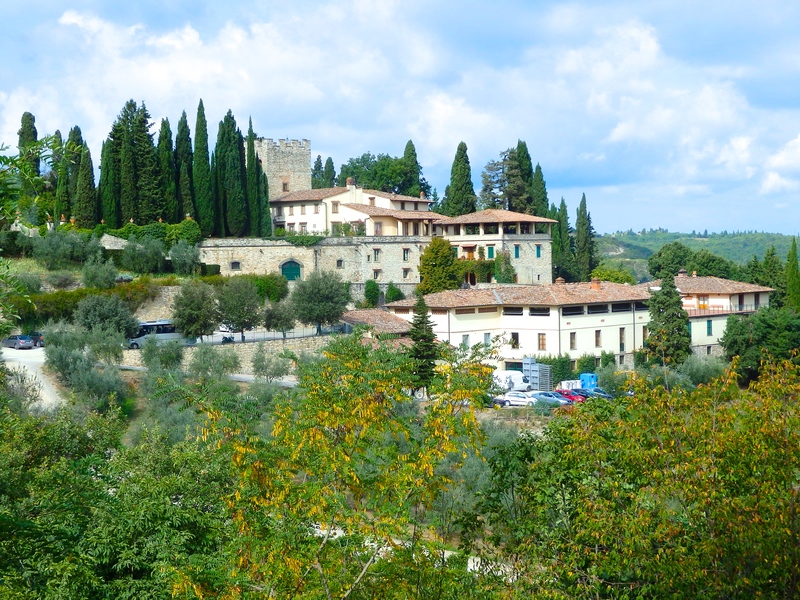 Nestled in the heart of Chianti Classico lies the veritable Castello di Verrazzano. Surrounding Renaissance gardens give way to a late Romanesque tower that served as a lookout over the Greve valley to control the trade between Florence and Siena. The estate is truly picturesque. The Castello became Verrazzano family property in the 7th century. Interestingly enough, the word Verrazzano is “verres” in Latin, meaning boar, or “land of the wild boar.” On the estate there is a wooded pasture where wild boar are kept. However, the Verrazzano family is no ordinary brood. The famous navigator, Giovanni da Verrazzano, is credited with being the first to explore the east coast of the U.S. of America by persuading King Francis I to fund the expedition. Giovanni was convinced he could find a passage to the west from the Atlantic to the Pacific. It was on April 17, 1524 that he reached New York Bay. But on his third expedition in 1528, he fell in with a tribe of cannibals. Thus ended his illustrious explorations. He wasn’t forgotten, and the Verrazano Narrows Bridge in New York was dedicated to Giovanni. Designed by O.H. Amman, famous for the Golden Gate in San Francisco, it was inaugurated November 21, 1964. Three stones were removed from the foundation of the Castello Verrazzano in 1963 and walled up at the entrance of the bridge. On the same day, three stones from the bridge were extracted and fixed to the front of the Castello villa in Greve. All this talk about Castello da Verrazzano could not be complete without mentioning the outstanding and world renown wines grown on the estate. Among them are the Chianti, Chianti Classico, Super Tuscan such as Sassello di Verrazzano and Bottiglia Particolare. In the ancient cellars are housed vintages since 1924. Below is a link by Mercedes-Benz which hosts Castello da Verrazzano’s owner Cavaliere Luigi Cappallini driving around his estate in beautiful Chianti…a must see! Nice theme of blog Susan 🙂 Lovely post ! Looks like a lovely place to have a glass of Chianti! Greve in Chianti has a very nice Saturday morning mercato- I remember taking the bus there from Firenze. Too bad about the cannibals-and the fact they spelled his named wrong when naming a bridge after him! It sure is a lovely place to be! And for poor Capt. Verrazzano, I agree. Cannibals is bad enough:( Let alone the misspelling of his name. I would love to experience the mercato. I will be in Lucca in May, so this could go on my list of things to do which is getting pretty long. I wouldn’t miss it! The wine tour is amazing…have a great time! Another must do if you are in Italy. Yes it is! Chianti has so many charms that I find its always hard to get out of there. But then soon as i’m home I find myself planning another visit! Thanks Diana…yeah, the cannibal part shook me up. But, he put himself in the history books as a notable navigator…and a bridge named after him. Not too bad…..still, the cannibal part is bothersome!